My final embellishments were some enamel dots and a big Cherry Cobbler shabby seam binding bow! I hope you'll find some time in your busy schedule to play along with our challenge this week! 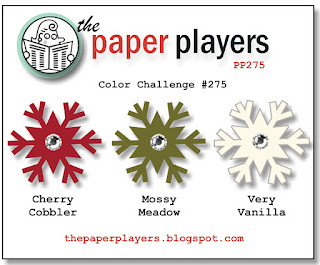 You can check out all the other designers' samples (and say good-bye to our current guest designers) at the Paper Players blog! I had a serious helper assisting me with my Christmas card addressing this year! She did very well adhering the postage stamps and address labels! (She loved the Charlie Brown ones!) So if you get a card in the mail from me, know that Cassidy put her own "stamp of approval" on it! Pretty helper you have there also. LeAnne, there are so many details to love on this card... I love the tree cut outs, the patterns you used, the crinkled ribbon, the embossed background.... all of it! And I love the photos of your Christmas card helper. I can't believe how quickly she is growing up! What a gorgeous combination of those stamps and die cut! The crinkled ribbon looks amazing, lending even more of a vintage feel. Thanks for playing along with us at Create with Connie and Mary! Love the colors you chose for the challenge this week! Your embellishments are so fun..love the ribbon and enamel dots....pretty card! You are so lucky to have such a good helper. Merry Christmas LeAnne! Love love love your card LeAnne! Love the crinkly ribbon. Love the embossed red background. thank you for your kindness and encouragement and friendship during my six months as a guest designer at the paper players. It has been a really honor and privilege and gift. Merry Christmas! A lovely card, LeAnne! Such a clever way to use the embossing folder and I love the addition of those big enamel dots. Tell Cassidy I got your card and I am so proud of her for being such a good helper! Merry Christmas to you, my friend! A beautiful holiday card, LeAnne! The embossing folder worked so perfectly with your stamped images. A very happy holiday to you and your family, and I wish you the best in 2016! There are so many pretty elements on your card and they tie together so nicely! I love your idea of using the enamel dots on your bells! Thanks for playing along this week at Create with Connie and Mary! Love the traditional Christmas colors used with the traditional images! Thank you for joining us at Create with Connie and Mary! So beautiful! Such a lovely colour combination - one of my favourites too. The sleigh ride edgelits are a fantastic detail. GORGEOUS card LeAnne! I just love the traditional Christmas colors along with the 'throw back' look of the images. So many cool little 'touches' on your card! Thanks for playing along this week in the Create with Connie and Mary Thursday Challenge! Oh...love the trees against the DSP...and how perfect your fussy cutting is! Gorgeous card! Thanks for playing along with the sketch challenge this week on Create with Connie and Mary! Oo I love the combination of stamps, shapes, textures and patterns on this card LeAnne - and such a clever take on the sketch too. A great colour combo!